Some people flee their coworkers once the day comes to an end, but these two can’t wait to spend time together outside of the office. 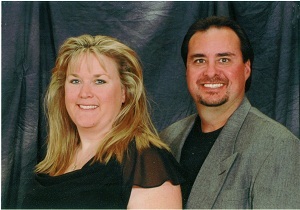 Meet Curtis and Barbara Daniels, a husband and wife Notary team from Oceanside, California, who have been in business together for 11 years. Barbara, a former bank teller, has been a mobile Notary and signing agent since 1997. But in 2003, the couple decided to add a storefront to their Notary business model and purchased a Post Net photocopy and printing franchise. The storefront helped them diversify their income opportunities beyond the mobile Notary business. Curtis obtained his commission in 2007 so they could have a Notary on site during business hours while Barbara continued to take on loan signings and other mobile Notary assignments. So how do they mesh their work and personal lives? “It helps that we get along,” Curtis said. Like the best friends they are, Curtis and Barbara cherish their shared daily routines. They begin their days at the gym, then go to work together and often return home together at the end of the day. “Sometimes we have personal interests after work that we do separately, but sometimes those things involve even more time together such as bowling in a league or attending our children’s sports,” Barbara said. Even though they spend so much time together, the couple draws a clear distinction between work and family obligations. “Business is business and home is home,” Barbara said. We love this! My wife and I are also a notary team at www.sdsignings.com! It has allowed us great flexibility to raise our kids while growing our business. Local businesses can depend on either one of us, although I tend to believe they all like her just a little bit more. For us it's nice to work together as a team in all aspects of life. Awesome! I hope me and my husband can be as successful! How can I contact Barbara? I love this approach and want to learn more...especially about becoming a signing agent. My husband is a Real Estate Broker. Hello Candice. If you can email your contact information to social@nationalnotary.org, we'll be happy to forward it to Barbara and let her know you're interested in getting in touch. Have a great day. @Anne D. Harris Florida is not a witness state for Mortgages, only for Deeds that transfer ownership (ie. Warranty Deed, Quit Claim Deed). Although Florida's statutes do not require witnesses for Mortgages, there are a couple of County Recorders who do require them. I believe Dixie and Suwanee County Recorders require witnesses on Mortgages. This encouraged me so much. I look forward to becoming a signing agent in Memphis, TN truly a blessing.